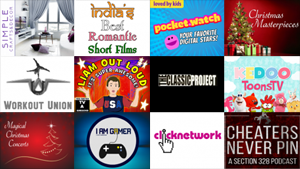 We reviewed 30 new Roku channels so far this week, with content in the categories of Fitness, International, Kids & Family, Movies & TV, Music, News & Weather, Religious, Screensavers, Special Interest, Sports, Themes, and Web Video. Click on the links below for more details on each channel, including our exclusive channel reviews. Workout Union - Exercise routines featuring "street workouts"
Catholic High School - Sports and school events from Catholic High School located in Baton Rouge, LA.